On Fangraphs initial projections for 2019 team WAR, they are only able to compute their numbers based on personnel on the 40-man roster. 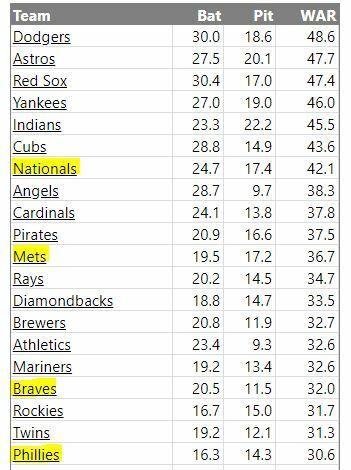 Some might think that the Braves who won the NL East are getting no respect, but they have some huge holes to fill in right field, the bullpen, and Fangraphs are no longer believers in Dansby Swanson and Julio Teheran while projecting regression for Mike Foltynewicz. The Braves star continues to shine with Freddie Freeman who turns 30 next year. For the Mets, they have new GM Brodie Van Wagenen as most of their starters are returning except Yoenis Cespedes who will start the season on the DL. The Mets need to rebuild their bullpen, and could look to make moves at the corners of their infield. They could start rookie Jeff McNeil at 2nd base and roll the dice on minor leaguer Peter Alonso for first base. At 3rd base, Todd Frazier could play there or move across the diamond to 3rd base while picking up a free agent at 3rd base. Van Wagenen has talked a big game so far, and he has a decision to make with the regressing Jay Bruce. The Mets can’t afford to have no run support behind Jacob deGrom again this season. With the 3rd place Phillies, they are looking to be the big spenders in the NL East. They are in need of corner outfielders if they move Rhys Hoskins to first base with a trade of Carlos Santana. They have the worst rated defensive team and are built upon a strong starting rotation. For now, they have Maikel Franco penciled in at 3rd base and J.P. Crawford at shortstop, and they have been rumored to be looking at Manny Machado for the left side of their infield. They are also rumored to be in on Bryce Harper which makes sense for them as they need an outfield upgrade. Carlos Santana is projected at a +2.3 WAR so if they do trade him they will lose that WAR. They need to add about a net +12 WAR this off-season to look legitimate. They were overachievers last year and Jake Arrieta just was not the answer, but they were rescued by Aaron Nola. For Arrieta, he is looking at further regression in 2019. In 2019, the Nationals once again project as the top team in the NL East, and that includes obvious holes at middle rotation starter, catcher, and back-up first base. 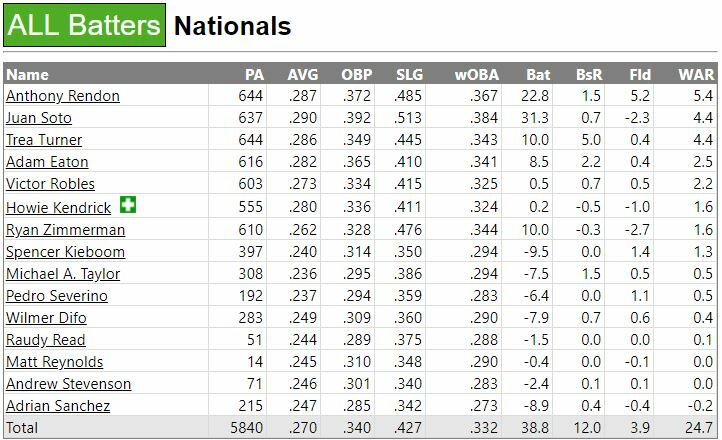 Fangraphs seems to like Erick Fedde as one of the Nationals starters and they are very bullish on Anthony Rendon, Trea Turner, Juan Soto, and Victor Robles. By the way, Harper is projected at a 4.9 WAR and Daniel Murphy is at 2.5 WAR. Some other notable free agents include Yasmani Grandal at 3.6 WAR, and Wilson Ramos at 2.8 WAR playing 114 games. 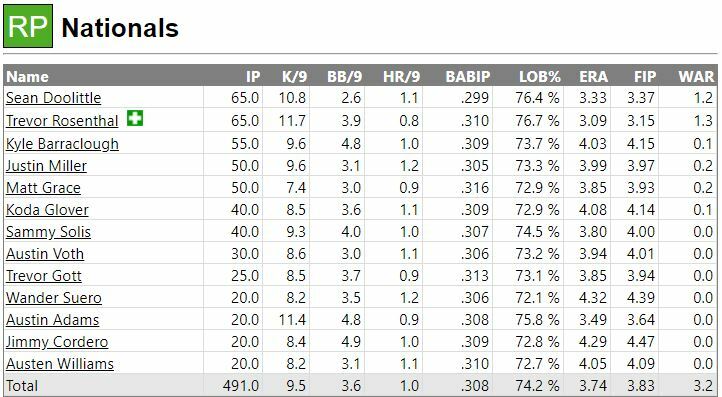 For starting pitchers, Dallas Keuchel is at a 3.2 WAR and Nathan Eovaldi is at 3.0 WAR. If the Nats could get a couple of those players imagine what the team WAR would look like.